Working on Mr. Greenjeans too. Knitting today while DH is at work, the boys are sucked into the X-Box Vortex of Doom, and the girl is plugged into the MP3 while playing Polly Pocket. Pictures before New Year's Day. I hope. Way back last summer - you know, when there was light and sun and warmth in the world - I helped my friends Africa and C with some home reno stuff. My husband helped Africa lay a hardwood floor (which is gorgeous!) while I laboured with the mudding and the sanding and the painting in the bathroom. I enjoyed it actually, and while it isn't a perfectly professional job it is more than passable. One day, as I was sanding drywall mud, C's father arrived to have a look at the general proceedings. Politely I came down and was introduced. "Dad" greeted me politely, then turned back to his conversation with Africa. Dismissed, I returned to my sanding pole but not before I overheard Africa explaining that I was the "bathroom contractor". We really should stop here and imagine for just a moment what I looked like: hair pulled back into a ponytail, no makeup, wearing a grubby t-shirt, shorts, and sandals, literally covered from head to toe in a layer of fine white dust except for the marks around my eyes from the safety goggles. Gawd! Ordinarily I wouldn't let anyone see me like that much less meeting someone for the first time. No wonder Africa called me the contractor. Now flash forward several weeks. Africa and C are hosting a long weekend bar-b-que for assorted friends and family. "Dad" doesn't recognize me without the dirt and tools in my hands, but Africa very kindly reminds him that I am the lady who did the bathroom. Recognition dawns, my hand is again shaken, "You're the bathroom contractor right?" I smile and nod. My faithful readers will recall that I have knitted socks for Africa (and will continue to do so until my fingers fall off because no one has ever taken more obvious joy from a pair of socks than he does!). 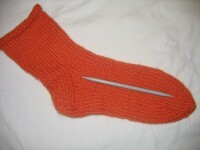 Predictably, the socks are proudly displayed to all, regardless of interest level, and I am identified as the knitter. "Dad" thinks this is pretty cool. "I want a pair of slipper socks." he says, "Can you make those?" "Of course." I reply, "any kind you like. They're not hard." And I went to peel my 7 year old daughter off the motorcycle where she was practicing for her photo shoot. Weeks pass. I think not one thought about the slipper socks until my cell rings. It's Africa, "Hey! Dad and I are just leaving and he was asking me about the slipper socks you said you would make for him. Have you started?" "He'd really like them... would you mind? Would you make him a pair? You said you would." Now, I don't really think I did make that promise, no details were discussed, and really what man in his right mind expects the bathroom contractor to knit him a pair of slippers? But Africa asked; and I will do it because it makes him happy. "What colour?" "OK. I'll see if I can get that..." but secretly thinking that must be a tough colour to find. Lamb's Pride Worsted comes in a colour called "Orange You Glad" which is indeed Home Depot Orange. Traffic Cone Orange. Pumpkin on Acid Orange. Navel Orange Orange. I bought 2 skeins, still not quite believing that I would knit them. After all, I didn't have a pattern. Thanks Dave... Your timing was impeccable. 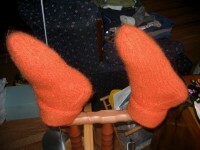 Your felted slipper socks, and the link to the pattern, appeared as if by magic. Then I felted them. You know your mate loves you an awful lot when he is willing to have two slightly damp and definitely chilly felted wool socks stretched over his tender toes at bedtime so that they can be blocked into foot shaped slippers. I have no idea how big Dad's feet are. I still can't believe that I actually knit them ... and here is my darling, lying in bed reading a novel as I pull and tug and stretch damp wool over his feet. Here they are then - Home Depot Orange...Traffic Cone Orange...Acid Pumpkin Orange...Navel Orange Orange felted slipper socks for my best friend's father-in-law who still thinks I'm the bathroom contractor. Dad got his socks at a Christmas party Dec. 15. The sparkle in his eyes and the absolute glee with which he put them on made me very, very glad that I made these for him. I'm told he's worn them every day since, and loves them very much. What more could a knitter possibly ask for?